Before and after, what a difference! Remember, we planned to use a smaller 2" double hem on our lining fabric. Same steps as before, but half the size. Fold the bottom edge of the lining up 4" and press... fold the cut edge down into the seam and re-press. Stitch at the top with a blind hem stitch (video tutorial here) or a straight stitch (I opted for this). Lay your fabric out wrong side up on clean floors. * Hint - I used painter's tape to keep my face fabric from moving before I placed and adjusted the lining layer. Use the diagram below to help you. Trim the lining if necessary for it to lie 1/2" from the top, 1" from bottom and 3" from each side. I lined up my center seams and moved my cutting mat along the side as I trimmed the lining edges as needed. When working with extra wide fabric widths, I found that using a yard stick helped me smooth out the fabric. Just go slow, work in small sections and be gentle. Remember how we ironed and folded to create the bottom hems? We are going to do nearly the same thing along the sides now; creating a pseudo 1.5" double side hem fold. Now you can easily see where the corner of your curtain will be, so add your corner curtain weights through the open side. Tack into place by hand. Fold your side seam back over. Tuck the fabric edge into a triangle (see below photo), to neaten. Hand stitch into place using a ladder stitch (I think I may have forgotten to sew mine down now that I think about it, oops). Tuck your lining edge into the fold as shown below, they should match up or you can trim your lining a tiny bit more if you find your fold is too thick. It should look like this, the orange dotted line is your lining's edge under the fabric fold. 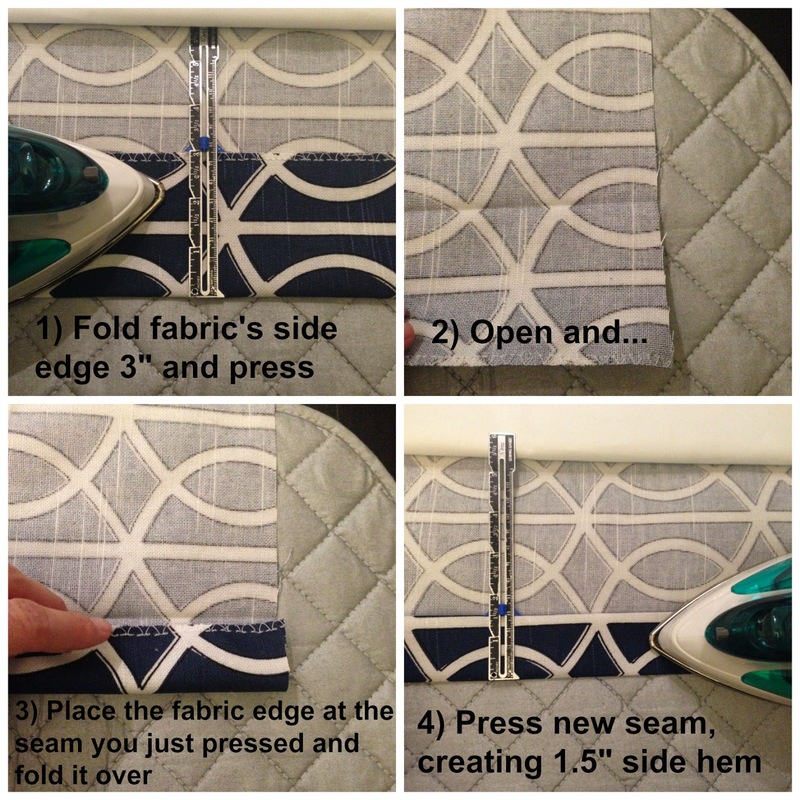 Pin the face fabric to your lining in this position, with pinhead at curtain edge and sharp end towards the center of your panel. 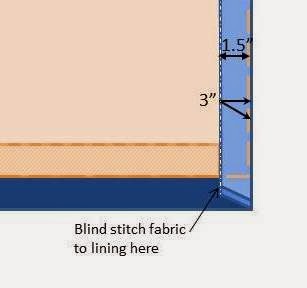 Blind stitch along the edge using invisible thread as your top thread, stopping sewing 4" from the top of your curtain to leave room for your buckram. my blind hem stitch you just sewed (bobbin thread was white and top thread was clear, so no stitching shows on the front side of the curtain). This time it's going to be an 8" double hem fold. With your 4" buckram inserted under your side hem, fold fabric edge down 4" and press. Repeat once more so that the raw fabric edge is tucked inside as shown below. And use your ladder stitch again to close off the sides of the hem you just folded over. Sew down both sides (about 4" or until end of fold). 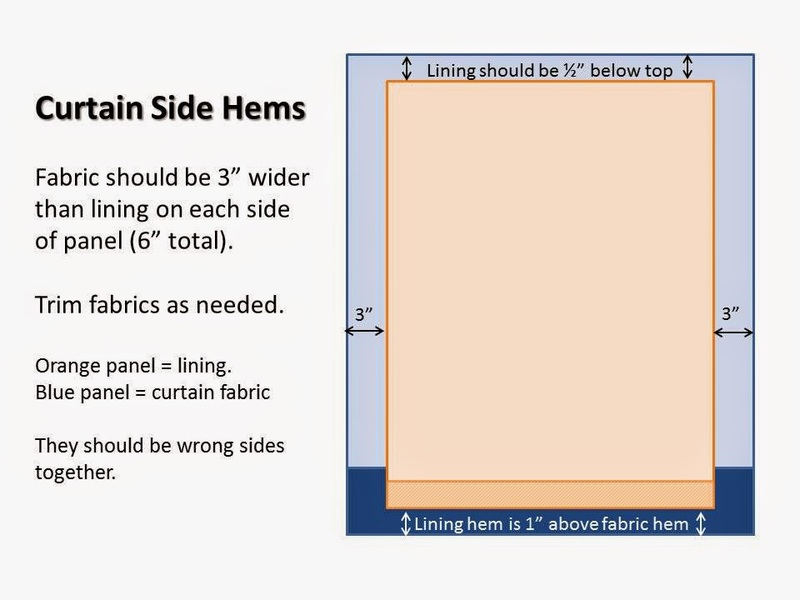 IF and only if, you are making a flat panel curtain to hang with clips, you can blind stitch along the edge of your fold (similar to how we did the side hems) and call it a job well done. If you are following along and using the clip n wave header tape, like me, you will attach the header tape and secure your top hem all at once as shown in the video below. If you opted for a different kind of header tape (various Rowley's header tapes found here), you will need to follow the directions specific to the curtain header tape you select. I sewed my header tape to the top of my curtain panel using Rowley's pdf directions for the clip-n-wave header tape. I used clear thread in my bobbin and regular thread on the top, so that my stitching wouldn't show on the front side of my panel. 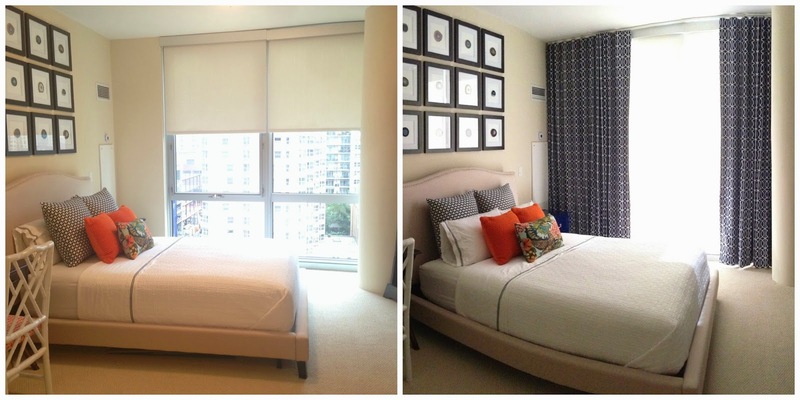 One curtain panel using clip-n-wave tape. Your second panel with come together much quicker than your first, I promise! Later I adjusted the waves to be less dramatic, so it's personal preference on how "wavy" of a look you want for your room. I hope this tutorial has proved useful. If you have any tips or pointers, I'd love to hear them. I'll try my best to help with any questions, just know I'm not an expert, just sharing what worked for me. Your curtains turned out beautiful. Thank you for sharing. I'm looking for the exact same look of pleating and fullness. How wide is each panel? Hi there! I think each panel might be around 100" across after hem allowances. I planned to use 2.25 fullness, but it was such a ridiculous amount of material for a home sewer (me!) to work with, I think I only did 2 fabric widths instead of 3 for each panel. Keep in mind it's a very wide window - better to measure yours and multiply by 2 or 2.5 (industry standard), then divide by 2 to get the width to make your panels look full and professional. The timing of your question is perfect - now that we've moved, I hope to cut them down & hang them on a different set of windows. Might be a productive distraction from all the unpacking that awaits me.